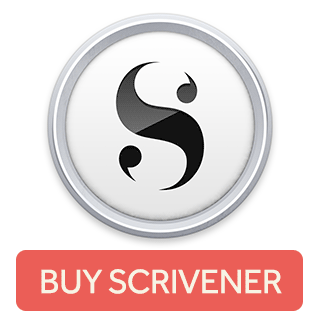 Scrivener is $50, but it’s an extremely useful tool and you only have to pay once. And you’re allowed to use the same license on multiple computers which you own and are the primary user of, as well as the computers of family members who live with you. I’ve found this very useful in that it keeps all of your documents (story, character profiles, setting descriptions, research, etc.) in one file so that you can easily access them all from the same interface. Another aspect I’ve found super useful is that it allows you to see two documents side-by-side. This has been helpful for me in rewriting, because I can see the original as I’m writing the new one so I know what I want to keep and what I want to change as I’m writing. There are also features like the distraction-free mode, you can easily export your book to a word document no matter how small the sections are that you wrote it in, and you can design templates so that – for instance – all of your character profiles look the same. This is a free online word sprinting app set up like an RPG game battle. You set a word goal, and that’s the monster’s HP (health points, for those of you who are unfamiliar with the term). As you write, the monster’s HP decreases and yours replenishes. The monster attacks you whenever you’re not writing, and you can customize how quickly and how much he hurts you. It’s great for getting your writing speed up. This is included in most Windows computers, I believe, and it’s just a really simple word processor. I like it for writing when I’m not using one of my other tools (Scrivener, Google Docs, 4thewords, etc.). I have copies of most of my stories in Word documents so that I can store them in my usual writing folders on my computer. I also use Word to format my stories for conversion to PDF when I’m preparing to publish them through CreateSpace. This is another RPG-based tool. It’s set up like a full RPG, with zones, quests, wardrobe items, weapons, etc., but most of them are earned by writing. You battle monsters with time limits and specified word counts that are their HP, and they give drops that count toward quests or serve as crafting materials, depending on the monster and quests. It’s a really cool tool, and I’ve been using it for about a year now. It also records your daily streak, which keeps me, at least, motivated to write every day. The minimum to reach a streak for the day is 444 words. Update – 10/2018: Since a total site redesign at the beginning of October, 4thewords has been nothing but frustrating. I rescind my recommendation. How this will work exactly depends on the person making it, but my story binder has character profiles, world information, and the first 49-ish pages of The Last Assassin. I like it because it’s something I can reference while I’m writing without switching programs or minimizing my story or anything (something you can also do with Scrivener using their two-pane view option). Plus it also makes me feel like I have some artistic talent to decorate it with fancy fonts and washi tape and stuff like that. Cost: Depends on the cost of the binder, paper, and whatever you use to decorate it. See more of my story binder at the above link. Which should maybe be called my goal journal, because that’s the thing I use it for most. I use it to set and keep track of monthly and daily goals, as well as whatever writing-related things I happen to need written down while it’s around. I.e. Several characters’ MBTI types, a list of authors I’d like to interview here on the blog, future blog post ideas, etc. Cost: Depends on the cost of the journal and whatever you use to decorate it. See more of my bullet journal at the above link. This is an amazing book and an amazing worldbuilding reference. It’s a fairly small book, but there are so many worldbuilding ideas in here! You could spend weeks working straight through this thing. It’s incredible. What’s in your writing toolbox? Do you use some of these, too?